Although the use of stable transformants is indispensable to elucidate mechanisms underlying molecular plant–pathogen interactions, this approach remains difficult to apply to crops. Alternatively, biolistic transformation has often been used as a transient expression method in various plants. In this study, we developed a method for in situ biolistic transformation without separating leaves from barley seedlings by using a hand-held particle bombardment system because unwounded leaves are preferable for analyzing interactions between barley and Blumeria graminis f. sp. hordei which requires healthy living cells. 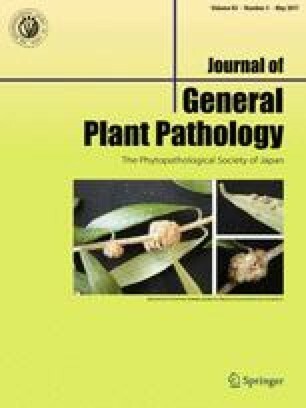 As a result, we found that the infection rate in intact leaves was higher than in separated leaves and that the transformation efficiencies in leaves were higher when plants were grown in vermiculite rather than in culture soil. Furthermore, we determined the appropriate inoculation time after bombardment to analyze the incompatible interaction and successfully monitored the gradual occurrence of cell death over time. Our system was suitable for relatively long-term follow-up analysis of the fate of each single cell during plant–pathogen interactions. The online version of this article (doi: 10.1007/s10327-017-0712-0) contains supplementary material, which is available to authorized users. We thank Dr. Beat Keller (University of Zürich) and Dr. Tsuyoshi Nakagawa (Shimane University) for kindly providing the plasmids pV26-UMUG and pGWBs, respectively. This work was supported by the Inamori Foundation, Institute for Fermentation Osaka and JSPS KAKENHI Grant Number JP24780046 and JP16K07618.